A pavilion will create shade that will keep a water dish out of direct sunlight no matter where the sun is shining. It will also provide another place for the tortoise to rest in the shade. This is valuable if your yard has little shade elsewhere. There is more than one way to make a pavilion. What is important is the minimum of 4′ x 4′ dimensions of the frame and the relatively short above ground portion of the legs-8″ to 10″. These dimensions will ensure that the dish is shaded despite changes in the angle of the sun through the seasons. The cover should not be solid because that traps hot air. Materials for two types of pavilions, a wood frame with a bamboo reed cover and a PVC pipe frame with shade cloth cover. For a wood frame use 2 x 2s, 5, 4′ lengths for the top and 4, 14″ lengths for the legs. For the cover use a piece of reed fencing that is 5′ x 5′ and 4 small screw-in “L” hooks for the legs. The hooks can be twisted to hold down the cover or release it for access to the water dish. For a PVC pipe frame see the other side of this sheet for materials. 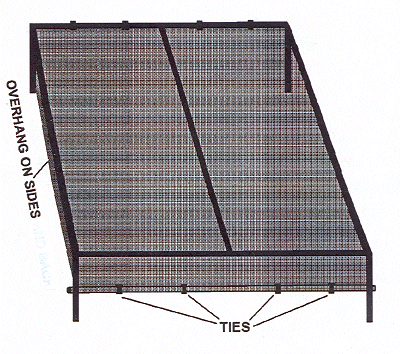 After assembling the PVC pipe frame use several locking ties to attach one side of the shade cloth to the frame and on the opposite side allow several inches to hang over the frame to wrap around the 6th 4′ length of pipe until the overhang is 61/2″ to 7″. Secure with locking ties. This overhanging portion and the other two sides will not be attached to the top to allow you to fold back the cover and tend to the water dish. Fill the pipe that holds down the overhanging shade cloth with rebar or other heavy material and cap both ends. For stability, the legs of both kinds of pavilion should be buried in the ground leaving 8-10 above ground. For important information about the dish size and placing and securing it read the section on WATER in the Tortoise Group Booklet, Desert Tortoises Adoption and Care. Once in place, the water dish should not be removed. Reseating it so it will be level and snug is difficult once the dish is lifted. Flush and fill with a hose or a bucket of water. The growth of green algae that may appear in the dish does not have to be removed. Algae naturally oxygenate the water. Use only water to clean the dish. No bleach or cleansers.